Our first glimpse into the story of Midwinterblood is set in 2073, with main character Eric flying a plane to the mysterious island of Blessed. It seems as if the people living on Blessed don’t get old – and as a journalist, Eric is looking for the next big scoop. However, the longer he is at the island, the more he starts to forget what he has come intended to do. 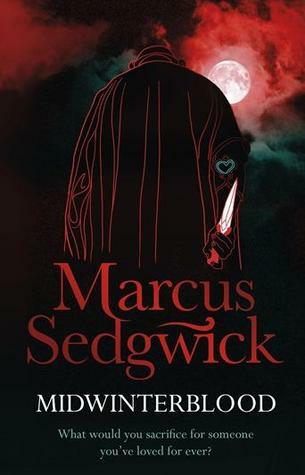 This is the second book I’ve read by Marcus Sedgwick, and I recognised some of the imaginary he uses in Midwinterblood from White Crow. I feel like the settings were very similar, and both combine a historical story into a contemporary one. Especially when the climactic scenes of both books involve old crumbling churches, I feel like the author is trying to make some sort of point. 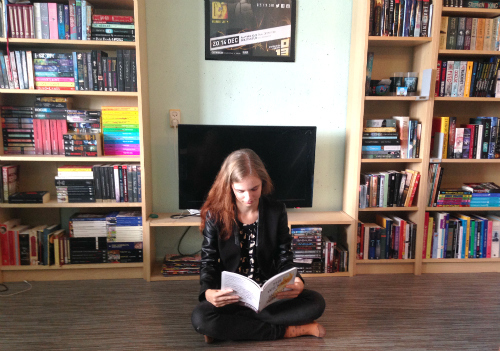 Some writers connect their books in certain ways, be that in themes, characters, or places, and Sedgwick does something similar. Character-wise, Midwinterblood and White Crow aren’t close at all. The main character of Midwinterblood is a grown man, where in White Crow we follow a teen girl. The fact that the main character of the book is a grown-up threw me off. Although the book is categorised as a young adult book, I don’t necessarily see a reason to do so. The language felt juvenile (more like a middle grade book), yet the characters are adults. The themes explored have nothing to do with being a teen. I think the book was more about being ageless rather than being YA, but the end result was weird. It’s not a bad thing not to fit in any box, but it’s not particularly admirable in itself either. The plot of Midwinterblood meanders through the ages, made up from seven nearly separate stories. All of the stories are connected in some ways, some more obviously than others. It took me a few stories until I fully understood what the author was trying to do. It was nice to find out the similarities and differences in all of the stories, and fitting together the pieces of the puzzle was satisfying. The rather abrupt nature of both the writing and the plotting made that the book left less of an impression than it could have. The characterisation was too thin in some stories, and nearly non-existant in others. Reading Midwinterblood was a strange experience – not scary per se, but rather unsettling. It’s an unique book, and I have no idea what kind of readership to recommend it to.